Sourwood trees are beautiful trees that bring their beauty in the heat of the summer months. These trees, unlike many others, do not bloom until the heat of summer. The blooms of the tree are large and white coming in small clusters. These small blooms are fragrant and accompany the thick green leaves. These trees turn in the fall into beacons of red, yellow and orange, looking like living fire. These trees also produce small grey seeds that can be eaten by birds and provide a winter food source. Sourwood, also known as the sorrel tree and scientifically referred to as Oxydendrum Arboreum, is a small tree or large shrub that grows 30 to 60 feet with the trunk measured at 20 inches in diameter. In rare cases, this species can extend heights over 30 meters and a width of 60 centimeters on very productive areas. The roots are superficial, and the tree grows best inland with little to no root adversaries. Sour Weed Trees also needs acidic land for optimal development. 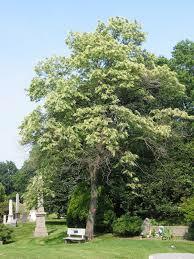 The leaves of Sourwood trees help eliminate the feeling of dry mouth, yet should not be swallowed. The bark of Sourwood trees is gray with a hint of red. It's profoundly furrowed and scaly in texture. Small branches are mild yellow-green at first but change to a red-brown when the tree matures. The wood is also red-brown, with lighter sapwood. The forest of these trees is very heavy, robust, and close-grained. The winter buds are feathered, small, and dark red. They are partly saturated on the bark. Internal scales increase in size when spring growth starts. Leaves are oblong and wedge-form at the base. During midyear, cream white flowers emerge in terminal panicles of secund racemes with a length of seven to eight inches. The fruit is a capsule-shaped, five-valved, and edged by a persistent style while the pedicels are showcased in a curved placement. 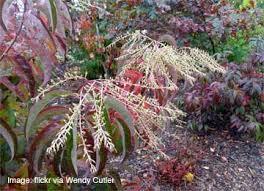 Sourwood is suitably strong in the northern states of the country and an excellent ornamental tree on front lawns and parks. 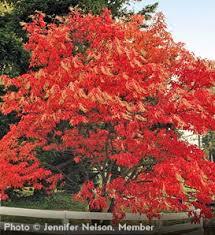 Its post-mature blooming makes it ideal, and its autumnal shading is exceptionally vibrant and awe-inspiring. The leaves are overly immersed with acid, and to some length manages the poise of those of the peach trees. The leaves can also be used as a laxative. The tree is well-recognized for nectar and the honey sourced from it. The blooms are extracted for its juice, which is used to make jelly. The tree shots were used by native Americans to devise arrow shafts. Sourwood trees are predominant within eastern North America, from south of Pennsylvania to the northwest of Florida. It is commonly found in the broader areas of the Appalachian Mountains. The species is also frequently seen as a part of the oak-heath forests. A growing Sourwood tree is invulnerable to any infestation, disease, or minor cultural dilemma it encounters as long as it gets the well-excavated, acid-rich land it needs. As said earlier, the roots are shallow and quickly disturbed hence it is advised to plant from premature, balled-and-burlapped stock. If you plan on replanting it, the best season would be Spring. Make sure it is well watered and mulched until the base is solid. Avoid planting the tree in overly polluted mediums that could prohibit their continuous growth and development. If the tree is planted correctly and maintained, it can grow fast and very hard. Fortunately, Sour-wood tree is elementary to take care of. Directly place it on acid-rich soil and water it every day. Sour Weed Trees are often eaten by birds.